The class name may look a little odd to most as it begins with an “I”, this is usually the naming convention for an Interface but I’m using what I like to call Simon Says naming convention. I’ll be writing a post about this in the near future. The main gist of it, is I like to have classes tell me what they do. For example, a class which calls a remote service might inherit from a class(or interface) called ICallRemoteServices. So the full class name definition would be FooService : ICallRemoteServices. 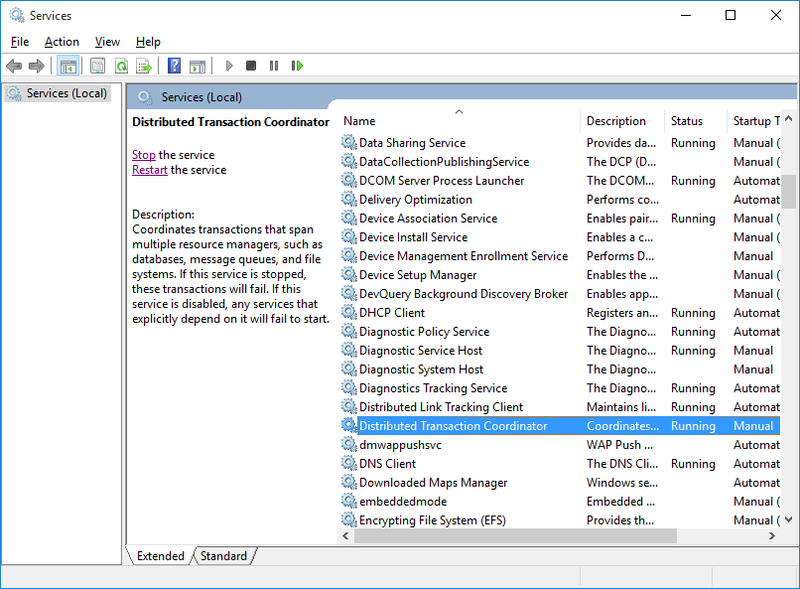 There would also be a abstract method defined that implements the action e.g CallRemoteService. Other example are IAmAnOrder(for a value object), ICalculateShipping, IDeliverEmail etc. This may seem a little weird but I like it 🙂. So enough of that for now, lets go through the class. First we declare fields to hold the familiar IModeland Connection instances. Next up are fields to store the details of the Server, Exchange andExchangeTypeName. 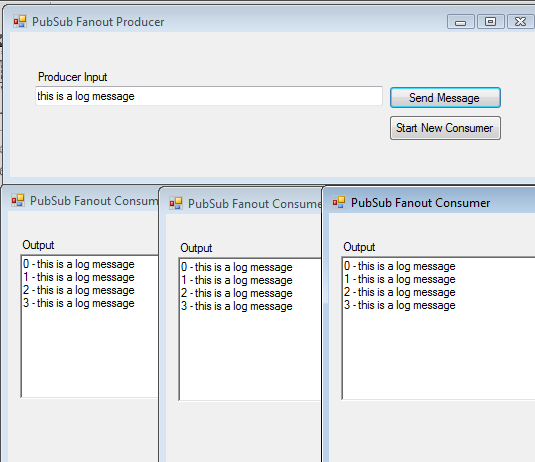 Exchange is the name of the exchange we want to publish/consume messages from and ExchangeTypeName holds the type of exchange we want to use(in this example it will be “fanout”). ExchangeType is set from a constant declared in the RabbitMQ.Client.ExchangeType class, so for us it will be ExchangeType .Fanout(More on this later.) 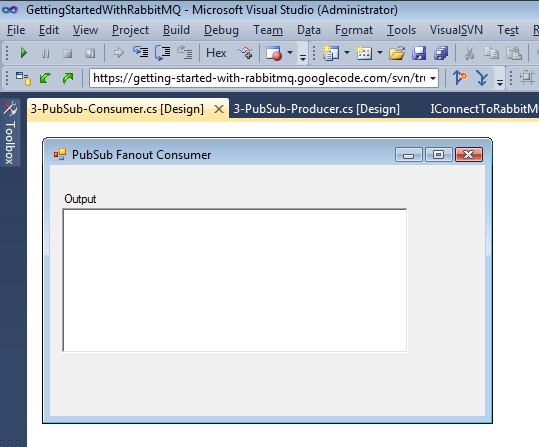 Next we have the ConnectToRabbitMQ() method, this is almost exactly the same as the Constructor methods of the Producer/Consumer methods in my previous two examples. We have this additional block which declares the Exchange. The Consume() method is very different to what we have seen before(and the Java Example). Instead of using a QueueingBasicConsumer we are using a Subscription. 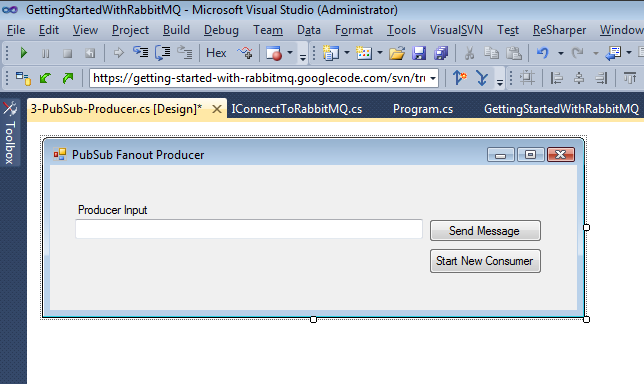 Subscription is part of theRabbitMQ.Client.MessagePatterns package in the .net client Library. It give us a nice wrapper to the boilerplate message de-queuing code. More info is here.